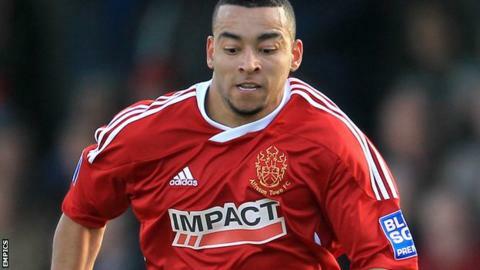 Goals at either end of the match saw Alfreton win for the first time in four matches by beating Macclesfield. Defender Dan Bradley fired the visitors into a first-minute lead with a 25-yard left-foot rocket. However, Macclesfield were gifted an equaliser when Ross Killock brought striker Chris Holroyd down in the box. Striker Matthew Barnes-Homer converted the penalty but midfielder Nathan Arnold drilled home with three minutes left to seal the win for the visitors. "It was well deserved. We got off to a dream start and then I think we controlled the game. "I was slightly disappointed with their goal. It was just a bit of a long, hopeful ball forward and we've let the ball bounce in our box and then it was a bit of a scramble and the referee gave a penalty. "On first reaction, there's probably no argument with that because I didn't really get a great look at it, but as a defender, you can't let the ball bounce there. "We reacted well against a big side, a big club, so it's credit to our players that they've come here and worked hard, but when we play at that tempo, we're a match for everyone as we've proved again."